I have a tiny kitchen and I love it! Other than large family parties when my relatives all want to congregate in it to chat, I’m very comfortable in my tiny kitchen. When you think about it there are definite advantages to having a small kitchen, such as when I’m cooking and everything I need is close at hand. As a Professional Organizer I have had the privilege of organizing some truly spacious and gorgeous kitchens. I will confess that every now and then I succumb to big kitchen envy. Can you imagine how thrilling it is to have so much room in a kitchen that it accommodates multiple food preparation zones? I remember one kitchen in particular that, in addition to all the “normal” things found in a kitchen, it had a whole counter arranged as a coffee bar with three different types of coffee makers. This kitchen also had a dedicated smoothie area with blenders and “bullets” to concoct any type or flavor of smoothie imaginable. In my tiny kitchen storage space is very limited. This is a blessing because it encourages me to keep only the items I love and want to use. There’s no room for things I don’t like or items I feel compelled to keep out of guilt… like that ugly, bulky cookie jar with all the characters of the Wizard of Oz that my mother gave to my daughter when she was 5 years old (ask me sometime to tell you about my husband’s best “whoops” moment). My tiny kitchen has only two lower cabinets to store all my pots, pans, mixing bowls, blender, salad spinner, colander, etc. My supplies all need to do double duty and I need to utilize all available storage space. See my “before” picture below of one cabinet where I utilized the vertical storage space available on the inside of the cabinet doors to hang pot lids using command strips. Then last November a Genie came into my life and magical things happened to my tiny kitchen! If you were a child of the 60’s you may be picturing a Barbara Eden look-alike sitting cross-legged on my counter top (I Dream of Jeannie….best show ever!). Actually, I don’t mean that kind of Jeannie; I am referring to the Shelf Genie! I had known about the Shelf Genie products for several years and even referred friends and clients to them who had installations as far reaching as South Carolina. Then I arranged for my local franchise owner and designer, Alex Modica, to come for a consultation. He informed me that that the bar down the middle of my cabinet was cosmetic, not structural, and could be removed to accommodate slide-out shelves. Woohoo!!! 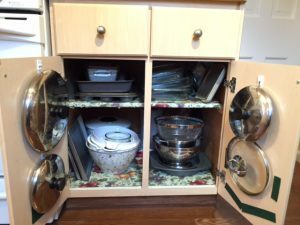 You mean I would no longer need to remove all the bowls and pans from the front just to reach the salad spinner and muffin tins in the back? 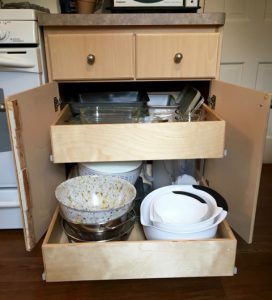 Now I slide out these beautiful custom made drawers and easily retrieve all kinds of cooking utensils and supplies with ease. It’s hard to imagine, but I am even happier in my tiny kitchen! Thank you, Alex, thank you, Shelf Genie! Come on over anytime for muffins, but call first because I might be out organizing a huge kitchen for one of my clients!